The University of Arizona is entering a new chapter in its relations with Mexico, broadening a partnership with Universidad Autónoma Chapingo, a federally-funded university system focused on agriculture. 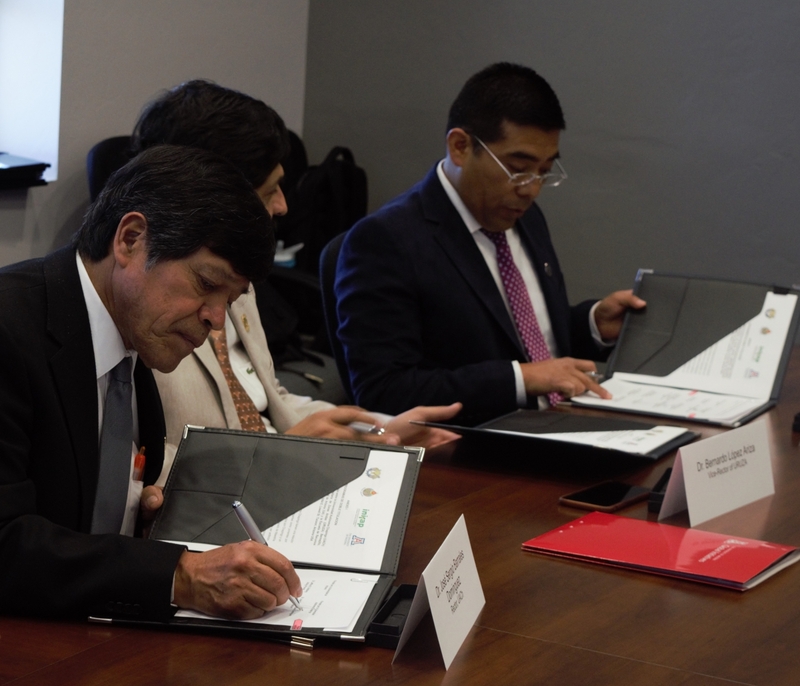 On April 4, 2018, dignitaries from Chapingo and the UA expanded a formal agreement between the two universities, establishing two doctoral-level dual degree programs, one through the School of Natural Resources and the Environment and the other through the department of Agricultural and Biosystems Engineering. The Rector of Universidad Autónoma Chapingo, Dr. J. Sergio Barrales Domínguez, was present at the signing ceremony in Tucson, as well as Shane Burgess, UA Vice President for Agriculture, Life and Veterinary Sciences and Cooperative Extension, and Larry Head, Acting Dean of the College of Engineering. The dual degrees are designed to attract elite graduate students from Mexico to the UA, giving them the opportunity to earn two credentials in roughly the same time it would take to complete one. Dr. Donald C. Slack, Professor of Agricultural and Biosystems Engineering and Faculty Fellow in the Office of Global Initiatives, spearheaded the initiative, an extension of his nearly 30-year relationship with students and faculty from Chapingo. He instructed 10 short courses at Chapingo over the course of 15 years, helped create graduate programs in agricultural engineering at the University, hosted undergraduate interns from Chapingo at the UA, and participated in a six-month sabbatical there where he acted as a visiting professor. Dr. Slack is also drawn to Universidad Autónoma Chapingo because if its unique history. 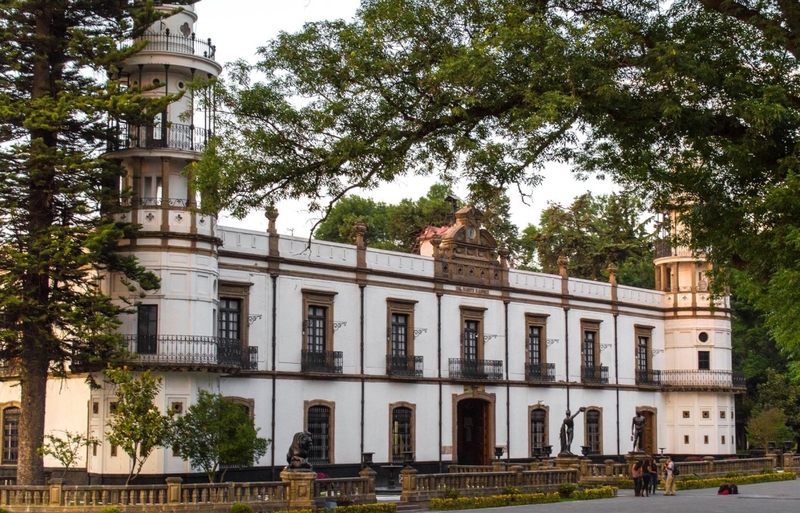 It was first established in 1854 as the National School of Agriculture in Mexico City, but following the Mexican Revolution, Hacienda de Chapingo was confiscated and given to the University for a new campus. In the early 1920s, the National School of Agriculture moved to the former Chapingo estate in Texcoco, about 20 miles northeast of Mexico City. Since 1992, 30 students from Chapingo have obtained their graduate degrees at the UA, the vast majority through the Agricultural and Biosystems Engineering department. The UA entered into its first formal agreement with Chapingo in 1997, establishing the groundwork for sustained faculty exchanges, student internship opportunities, joint research projects, and now, dual degrees. Although the dual degree programs exist in separate departments, they share many similarities. Students must meet both Chapingo and UA admissions standards, including an English proficiency requirement, to qualify for admission to either dual degree program. Jose Manuel Cisneros is familiar with those requirements. He is a professor and researcher at Unidad Regional Universitaria de Zonas Áridas, a branch of Chapingo located in the Durango state of Mexico. He completed his undergraduate degree at Chapingo and is now working toward a Ph.D. with the University of Arizona School of Natural Resources and the Environment. Cisneros is also supporting the current dual degree initiatives as a Chapingo contact at the UA through his academic co-advisor, Dr. Slack. Once admitted to either dual degree program, Chapingo students must complete 45 credits of coursework and 18 credits of dissertation research from the UA and more than 100 credits of coursework from their home institution. According to the agreement, students will spend one year of the dual degree program at the UA and must defend their dissertations in Tucson. Having students complete the majority of the degree in Mexico eases the financial burden on Mexico’s National Council of Science and Technology, better known as CONACyT. CONACyT has a history of sponsoring students from Mexico for Ph.D. programs at the UA, but this provides an affordable alternative to the typical doctoral degree timeline of four to five years in Tucson. Cisneros believes the financial component of the dual degrees is only part of the appeal. This is the first dual degree partnership with Universidad Autónoma Chapingo for the University of Arizona. Most dual degree programs at the UA are inbound, meaning an international student comes to Tucson to complete coursework and research required for a credential. The model provides access to prestigious academic programs at the UA and resources such as labs, internships, field work, and potentially, research funding. At the same time, international dual degree students contribute to the intellectual, linguistic, and cultural diversity of the campus community while potentially providing a steady enrollment stream for UA programs. Dr. Slack hopes the Chapingo dual degrees foster binational collaborations for years to come, and encourages faculty members to participate in international activities. He also believes the dual degree programs are not only great for faculty and students, but also for global relations. Interested in starting a dual degree at the UA? The International Partnerships team at the UA Office of Global Initiatives helps faculty members with the dual degree process, from inception to completion. They liaise with admissions offices, colleges, and the Office of the General Counsel at the UA to ensure that graduation requirements comply with the law. They also work with International Student Services on visa considerations. Contact Dr. Dale LaFleur for more information: dlafleur@email.arizona.edu. This agreement provides opportunities for students from Universidad Autónoma Chapingo – Unidad Regional Universitaria de Zonas Áridas (URUZA) to earn a doctoral agree from URUZA in Natural Resources and Environment in Arid Lands and a Ph.D. from the School of Natural Resources and the Environment through the College of Agriculture and Life Sciences at the UA in one of three emphasis areas: Ecology, Management, and Restoration of Rangelands; Natural Resources Studies; or Watershed Management and Ecohydrology. This agreement provides opportunities for students from the Universidad Autónoma Chapingo Graduate Program in Agricultural Engineering and Integral Use of Water to earn a doctoral degree from Chapingo in Agricultural Engineering and Integral Use of Water and a Ph.D. from the UA in Agricultural and Biosystems Engineering, a joint program of the College of Agriculture and Life Sciences and the College of Engineering.